The New Dawn Camisole is a post-surgical camisole designed for women to wear after breast or chest surgery. The drainage tube pouches can be removed and the camisole can be worn for leisure wear after surgery or during radiation. Washing Instructions: Machine wash gentle cold, use non-chloring bleach if needed. Do not use bleach or fabric softener. Tumble dry low or hang to dry. Velcro® front closure must be hooked together (closed) before washing. Remove the breast forms before washing. When washing the breast forms, remove the fiberfill. The pouches can be washed attached to the camisole or washed separately. 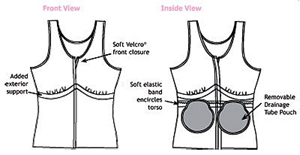 Get the lowest price on Wearease 905 New Dawn Front Closing Post-Mastectomy Camisole. We are dedicated to always offering the best service and value to our customers. We will match the price, at the time of purchase or until 7 days after your purchase, on a Price Match Guarantee product if you find the same item ( Wearease 905) at a lower price at a Designated Major Online Retailer or at a local retail competitor's store in the US.